“I wish to create a world where it is not about a battle among the powers and regions or a war of taking and being taken, but a place where there is no need for a loser in a race to become afraid,” Yim, 56, said at a press conference held at the SK Hall of the Graduate School of Business at Seoul National University. Yim, who served in several key posts during the incumbent administration, prides himself as having been a non-factional member of the then-Grand National Party in 2007. The fierce rivalry between Lee and his counterpart Park Geun-hye for the party’s presidential nomination at the time remains the origin of the rampant factional dispute within the ruling Saenuri Party. At the press conference, Yim denied speculations that his bid was concocted with Lee, denouncing it as an obsolete way of perceiving things. But he took time to defend Lee’s administration stating that Korea may not have dodged bankruptcy had it not been for the leadership that protected the country’s economy through the 2008 financial crisis. Yim, a Seoul National University graduate, was a public servant from 1985 to 1999, specializing in finance-related posts such as working at the Finance Ministry. He also handled finance affairs at Cheong Wa Dae. Yim, who is described as a “practical moderate,” has shown keen interest in inter-Korean relations as well, such as by suggesting establishing a special economic zone in northern Gyeonggi Province and the demilitarized zone to help promote the reform of North Korea. Yim had submitted a bill to create the special zone in 2006 and 2008, but failed to get it approved due to views that it was still premature considering the highly tense relations between the two Koreas. In October 2009, Yim made a special visit to Singapore under President Lee’s mission and met with North Korean Director of the United Front Department Kim Yang-kon to discuss a summit meeting. During his stint as labor minister, Yim focused on introducing the “time-off system,” which bans payment for full-time unionists in principle except for specified activities. Yim has been giving lectures on leadership at the Graduate School of Business at his alma mater since he left Cheong Wa Dae in December last year. While making his bid, Yim underscored his drive against old politics by denouncing the presidential frontrunners of both the ruling and opposition parties. 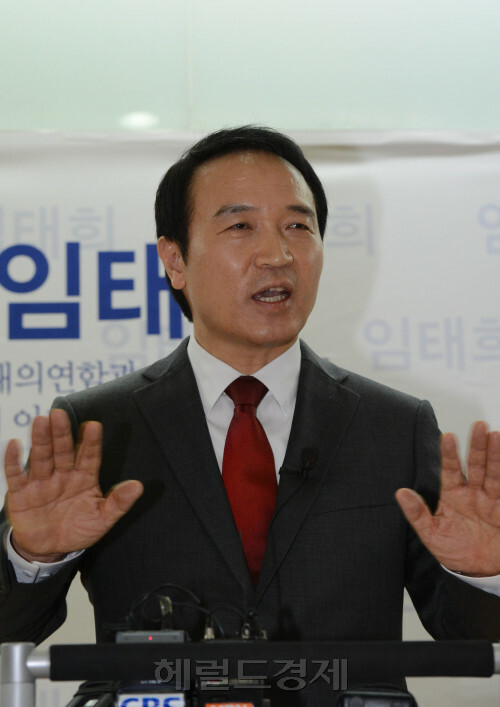 “We must go beyond the frames of former President Park Chung-hee and Roh Moo-hyun,” Yim said, obviously aiming at Saenuri chairwoman Park Geun-hye and the Democratic United Party’s Moon Jae-in. Park is a daughter of late President Park, while Moon was a close confidant of late President Roh. Yim suggested that Park should instead focus on becoming a “kingmaker,” making a bold challenge against her longtime presidential aspiration. Yim, on the other hand, proposed joining hands with software mogul-turned-professor Ahn Cheol-soo and another potential DUP candidate Chung Sye-kyun. “I wish that (Ahn and Chung) would partake in this venture (of tearing down regionalism, ideologism and factionalism),” Yim said.